Conor McGregor at fault for one of the most disrespectful moments in UFC history? Conor McGregor may have committed one of the most unsportsmanlike acts in the history of the UFC at a press conference on Tuesday. 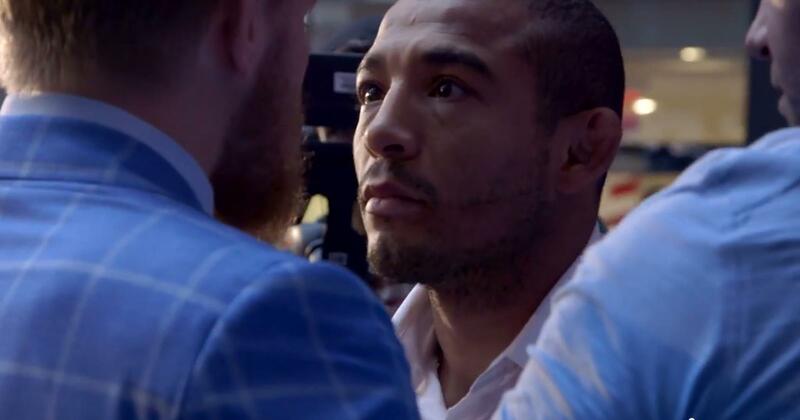 The Irish featherweight was sitting opposite his next opponent, the UFC Featherweight champion, Jose Aldo at a presser for their fight at UFC 189 in July. In front of a raucous home crowd in Dublin, McGregor responded to Aldo's comments of being 'the King of Dublin' by jumping up and grabbing Aldo's belt from in front of him. Aldo had to be separated from McGregor by UFC President, Dana White, who was also trying to grab the title back from McGregor. Eventually one of the staff managed to take it from him and give it back to Aldo, but by that point it had set off the fans into an eruption of applause and chanting. As the UFC presser world tour for the bout carries on, the intense hatred between these two fighters is ever growing. Despite being unable to speak much English, the intensity of Aldo is being sold through his face alone. With a thousand yard stare that a serial killer would be afraid of, Aldo is looking to hurt McGregor when they step into the cage and dismantle him like never before. While it's McGregor's forte to get under the skin of his opponent, you have to ask with how much he's turning it on, just how much has Aldo gotten under is. McGregor has gone to extremes before, even calling one his opponents, the German fighter, Dennis Sivir a 'nazi', but taking another fighter's title from in front of him is something more akin to the WWE than the UFC. These tactics may backfire as Aldo looks likely to snap as soon as they lock up. The long time featherweight champion is also a well oiled machine in title fights and keeps his composure well. Yet still, moments like this are only building on the hype for these two to finally lock up in the cage and with another three months to go before then, you have to wonder what both men are going to do next. At this rate it's unlikely they'll be kept in the same room together without Dana White present and that means trouble for the UFC. If they have another situation akin to that of Jon Jones and Daniel Cormier, there maybe questions as to how much they're riling up their fighters pre-pressers and how much they're rewarding them for it too.